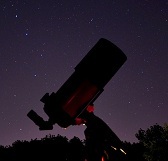 Illustrations & video credit & copyright: NASA. 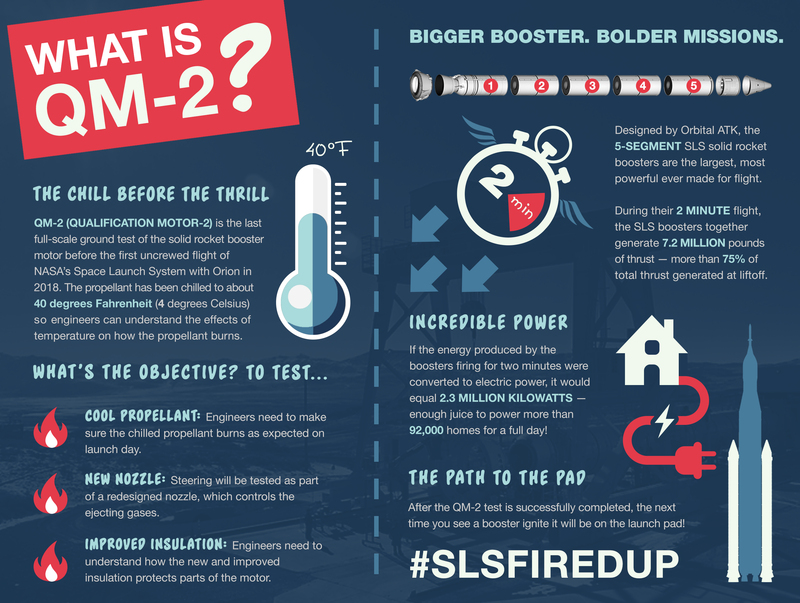 Tuesday, June 28, 2015 at 08:05 EDT (12:05 UTC) Orbital ATK will conduct the second and final horizontal static-fire test on a solid rocket booster (SRB) known as Qualification Motor-2 (QM-2) at their T-97 test stand in Promontory, Utah. These new 5-segment 177 ft. (54 m) long solid fueled boosters will be the largest, most powerful in history and each of NASA’s Space Launch System (SLS) machines will be affixed with two of them in a similar fashion to the Space Shuttle. The Space Shuttle 4-segment boosters were 149.1 ft. (45.46 m) long. The test this Tuesday will see the SRB powered for the full flight duration of two minutes where it will burn 1,385,000 lb. (628,225 kg) of propellant at a rate of 5.5 tons per second and reaching temperatures of 5,600 degrees F (3,093 C)! The power generated is 3.6 million lbs. of thrust (16 MN or 22 million horsepower) which is more than 14 Boeing 747’s each with four engines at full throttle. Before the previous test, the SRB was kept at 90 degrees F (32 degrees C) which is the high end of its mean bulk temperature range while this test is scheduled to be a cold test with the booster near its cold limit of around 40 degrees F. The temperature ranges for the 4-segment Space Shuttle SRB’s, for example were 55-80 degrees F. There will be 102 design objectives measured by more than 531 instrumentation channels to record test data. 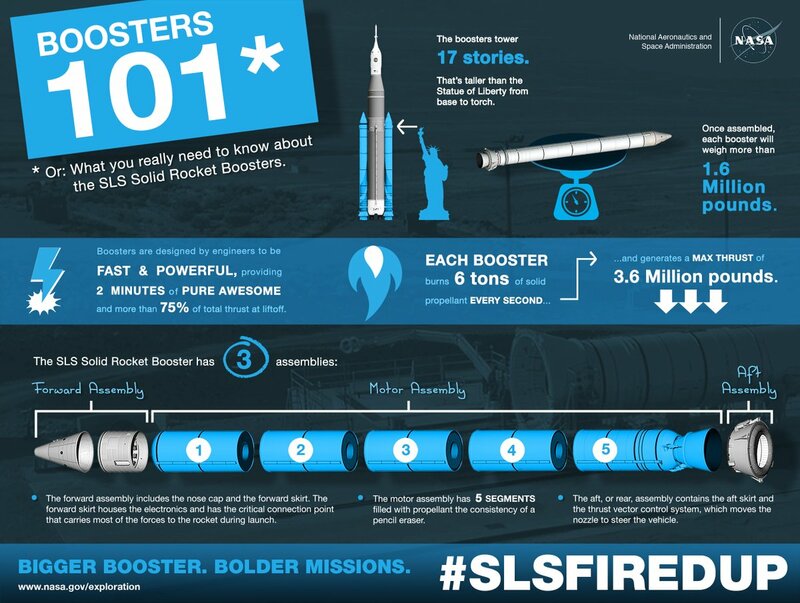 An interesting fact in regard to this booster, like the OM-1 test is that the parts and components used in this booster test were used and flown on 48 different Shuttle missions. Image | This entry was posted in Images, Launches, News, Spaceflight Companies & Vehicles, Video and tagged NASA, Orbital ATK, OrbitalATK, QM 2, QM2, SLS, Solid Rocket Booster, Space Launch System, SRB, STEAM, STEM, UT, Utah. Bookmark the permalink.